I’ve been home from the Philippines for nearly two weeks now. Within that timeframe, my framework for this blog post has shifted at least a dozen different times. I’ve started multiple posts with contrasting viewpoints, I’ve lost sleep (ok, that part was mainly jet lag) while typing out rants on my iPhone notes, and I’ve tried to process the best way to articulate my experience not only to you but also to myself. On our first full day in the country, we went on a several hour long walking tour in Manila. It was by far the most informative and comprehensive tour I’ve ever taken and truly helped us start the trip with a deeper understanding of why things are the way they are in the Philippines. This deep dive into the unique history of the Philippines broke down the ongoing effects of colonialism and reminded me that the context for every country affected by fast fashion (or any other exploitative business for that matter) is highly complex. No two are the same. It’s easy for me to get in a little ethical fashion bubble when we talk about ideals and solutions, but I was reminded to take a step back and consider the myriad of other factors in any country that is being so affected by this industry. To listen and learn first. Rags 2 Riches is a brand that I am such a huge fan of after spending a full morning at their headquarters. A few of their artisan employees patiently taught us a weaving technique to create mini clutches out of old garment scraps. Realizing how long it takes to even make a small item gave me an added measure of respect for the beautiful bags, rugs, etc that I later saw as we toured their building. When we stepped through the door of the actual factory room, I was struck by how small it was. I’m not sure what I was expecting, but to see how many beautiful pieces were made in such a small space was inspiring. 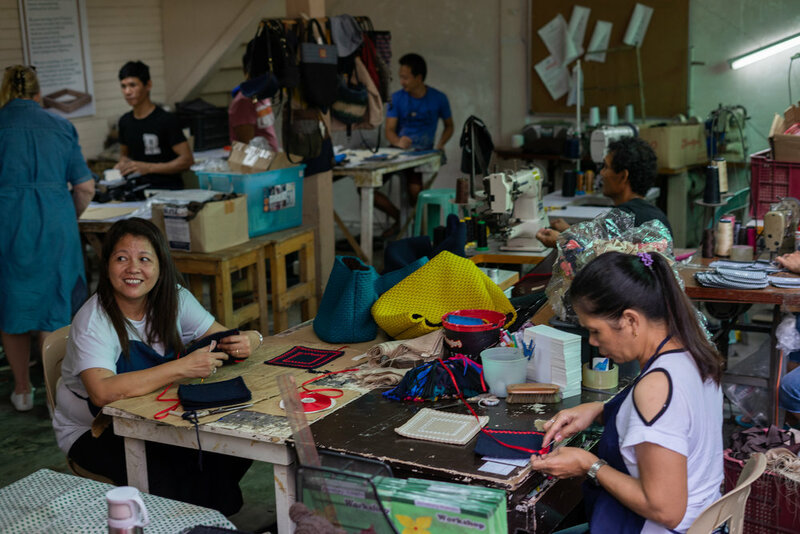 To know that workers are treated so well at this company reminded me that what we’re pushing for in ethical fashion is not for the rest of the world to look like what we think a factory should look like from a western perspective. We headed out to GK Enchanted Farm (one of the coolest concepts/places ever!) and learned about creating “vegan silk” through a process which uses the cocoon of the silk worm without harming the worm itself. The young filipino manager of this silk business is so passionate about his work and truly made me excited for the future and increasing ingenuity. During our long drives, I was so inspired chatting with one of our translators who is fresh out of fashion school and has a passion for sustainability. She casually mentioned how she has been experimenting with creating leather alternatives from dehydrated kombucha for her designs and is making upcycled fashion look better than ever. Creativity is the key to a more sustainable future in every industry, but it’s especially apparent in fashion. One of the most sobering experiences of this trip was our visit to the weavers in Bangar. The feeling of stepping into the open-air “factory” where these weavers work is hard to explain. All of the weavers were about the age of my grandparents. Bent over massive looms to create stunning weaves, they quietly went about their work while we observed. They’ve been weaving all their life - the skill passed from generation to generation. But, frankly, it’s a skill that’s at risk of being lost. Our guide explained to us that because weavers aren’t paid well, the younger generation is moving into the city for jobs at call centers etc. instead of taking on this ancient craft. After watching the weaves comes to life for a while, we stepped into a warehouse where we could shop if we wanted. I asked for pricing for a large blanket that I was looking at and they politely responded, “250 pisos” which converts to about $4 USD. For whatever reason, this was the moment that got to me. Watching these elderly artisans work their fingers to the bone. Knowing that their children aren’t interested in learning their trade. Being sold a blanket for less than my lunch that day cost me. I gathered a giant stack of beautiful weaves to purchase and paid far over the price they were charging. They were shocked at the extra payment and, in true filipino generosity, insisted on giving me a scarf for free. The long van ride that followed this portion of the trip was full of weighty conversations for our group. It was jarring to get a glimpse into the reality for so many artisans and to know that solutions are not simple. It was sobering to know that, though I could pay them extra for my purchase, I can’t swoop in and save the day from a big-picture perspective. There’s no Instagram account for me to shout out. No online store for me to link to and support as a blogger. I was humbled and heartbroken. Getting to tour (and shop at) Anthill Fabric Gallery in Cebu was the perfect follow-up to what we experienced at the weavers. Anthill stands for “Alternative nest and trading hub for indigenous little livelihood seekers" and it’s a well established social enterprise that supports and establishes community weaving enterprises. They’re partnering with weavers across the Philippines to incorporate traditional patterns into more contemporary pieces. I was so excited to learn that Anthill is working to train younger people in the art of weaving to keep this craft alive. They also do a lot of work in sustainability by creating designs that use fabric remnants in beautiful ways. There’s so much more I could say about all the ways Anthill is being conscious in every step of their business, and I am deeply grateful for their work. Companies like this give me hope in the face of big and scary problems. When we visited A Beautiful Refuge for a day, we had a chance to sit down with a few of the employees and hear about their lives. One of the women shared how she used to work at a factory sewing on tags on luxury leather gloves that said “Made in the USA” and was paid approximately $4 per day while the gloves were sold for $300. Another woman shared how she used to work twelve hour days sewing embroidery onto stuffed Winnie the Pooh toys for Disney and was paid less than minimum wage. I had read dozens of stories like this before, but something about sitting next to these women in person and meeting their children, hearing their individual stories, struggles from the past and hopes for the future was so incredibly impactful. My blood boiled hearing the stories, and yet I knew that these aren’t even the worst of what happens on a daily basis. When you’re face to face with someone who has been exploited within an industry, everything becomes a hundred times more significant than reading a statistic. It becomes all too real. As my eco-ethical-minded-strangers-turned-friends travelled through the ten day adventure together, we had some of the best conversations I’ve ever had in my life. On long van rides, short flights, looking over the urban core of Manila or the quiet beach town of La Union, we processed what we were learning and the perspectives we each brought from our past. We debated tough questions about impact, scale, ethics and culture. With open eyes and open minds, we looked outside of ourselves and listened to each other as we all just want a more just and fair future for our fellow humans and the planet. All of us are going about this in a different way, working within our individual skill sets and communities. Some of us are small parts of really big things, some of us are the core force behind fledgling projects. And I am convinced that we need all of it. We need little businesses who are putting roots down deep in one city. We need big businesses who are going to shift the tide of the industry. We need creative designers who will create new ways of manufacturing. We need the communicators who can articulate and invite others into this movement. We need me, with my inner conflicts and questions and determination not to quit. We need you, wherever you are, with whatever gifts or drive you have to make the world brighter.